Austin, Texas — Avaya Holdings Corp. is doing away with complicated product names and lumping them under what it’s calling Avaya Intelligent Xperiences (Avaya IX). This will affect the company’s entire portfolio of solutions for contact centre, unified communications and collaboration solutions, and the deployment models through which they’re deployed – public, hybrid and private cloud – are now part of the Avaya OneCloud platform. Avaya’s CEO Jim Chirico kicked off its annual Engage conference Monday by announcing the overhaul, citing brand confusion as one of the biggest reasons for the change. “We were, and in some instances, still are difficult to work with. But we have simplified our portfolio and our branding, as well as our product naming,” Chirico said, alluding to Avaya Intelligent Xperiences. The brand simplification and emphasis on cloud was a major talking point of Chirico’s during last year’s Engage conference, and he said much of 2018 was spent on restructuring the business to reflect those changes. “We have engineered a significant turnaround in the last year,” he said. Laurent Philonenko, senior vice-president of innovation, emphasized some of the company’s latest changes go beyond the branding simplification. “There are physical changes, too,” he said, pointing to the back end adjustments Avaya has made to help customers and partners navigate and access their services from a single interface, in addition to the launch of their new online store back in December. The store includes CC and UC communication bundles, smart desktop devices and other collaboration and workforce optimization solutions. The move was largely made to please mid-market organizations, which are increasingly tapping into Avaya’s offerings on the cloud. Avaya’s simplification of its product represented in one infographic. Photo by Alex Coop. Gaurav Passi, Avaya’s new head of cloud, who replaced Mercer Rowe in November, said the 3.5 million cloud seats currently in place is just the tip of the iceberg. “We have 145 million seats worldwide … we have a lot of work to do to move the next 140 million to the cloud,” he said, adding Avaya wants 25 per cent of its overall revenue to come from its cloud business by 2021. Avaya’s new private cloud offering, ReadyNow, introduced today as part of Avaya’s OneCloud solution for UCaaS and CCaaS, will help them reach that goal, said Passi. While the public cloud has seen wide adoption across the world, a lot of enterprises continue to have reservations about it due to security concerns, making a private cloud offering a no-brainer. 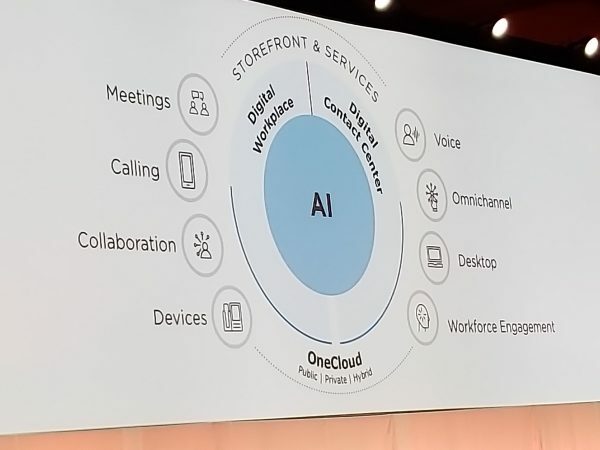 The new Avaya OneCloud ReadyNow private cloud offerings include preconfigured, per-seat consumption and standard bundles of both UCaaS and CCaaS solutions. Last year’s acquisition of Spoken has led to an additional 42,000 seats, and Passi said customers and partners can expect to see Spoken integrated further into Avaya’s other software solutions. And in addition to dominating the enterprise landscape, a well-known target audience of theirs, Passi said Avaya is looking to aggressively compete in the mid-market space. This is great news according to Dan Silverman, president at Telanet, an Avaya partner with a significant presence in Canada and the U.S – the business split right now is 40 per cent Canada, 60 per cent in the U.S. Telanet has been around for more than two decades, and was adopting VoIP technologies very early on. Telanet had a very close relationship with Nortel prior to Avaya’s acquisition of it in 2009. In an interview with CDN, Silverman said emerging technologies such as AI, which Avaya is doing a good job of integrating into its omnichannel services, need a lower barrier to entry. “Right now, it’s expensive to use and largely an enterprise play. So how do you take AI and bring that to the mid-market?” he said. Silverman applauded the simplification of Avaya’s portfolio, describing Avaya’s previous websites and channel portals as confusing and difficult to navigate. And while Avaya has successfully set a new course towards a software, recurring revenue model, he said Avaya’s go-to market strategy could be faster. Now that the company has further distanced itself from the Chapter 11 bankruptcy, Avaya is looking to accelerate its R&D efforts and add to its list of global data centres, said Chirico. Avaya currently has five data centres, and is planning to add a few more in the near future, specifically in Japan and Mexico. A spokesperson for Avaya confirmed to CDN that there are plans underway to build data centres in Canada to deliver the company’s private cloud service. ***Correction: A previous version of this story indicated that Avaya has no plans to build data centres in Canada. However, a spokesperson has confirmed that Avaya plans to build data centres in Canada to deliver the company’s private cloud service. CDN apologizes for the error.